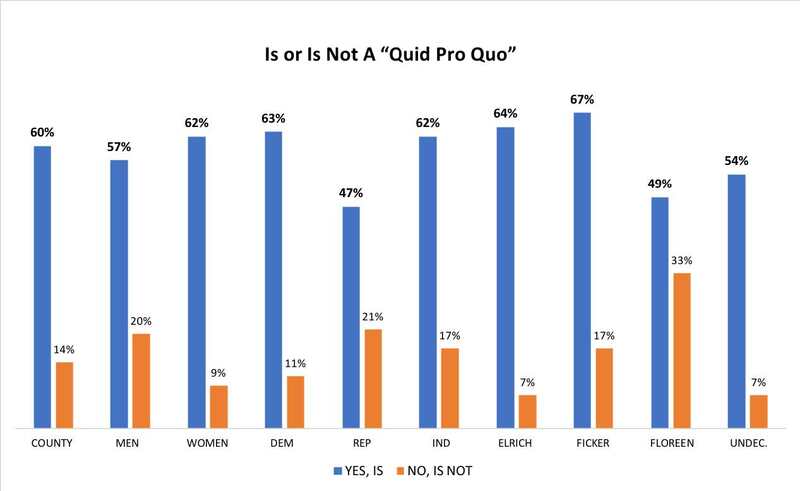 A Mason-Dixon poll done for outside groups at the end of September shed some light on why Councilmember Nancy Floreen’s independent campaign for county executive was ultimately unsuccessful. Specifically, gender played far less of a role than people focused on it thought. She did little to split either the Democratic or Republican bases. Finally, her inability to take public financing didn’t hurt Floreen much. 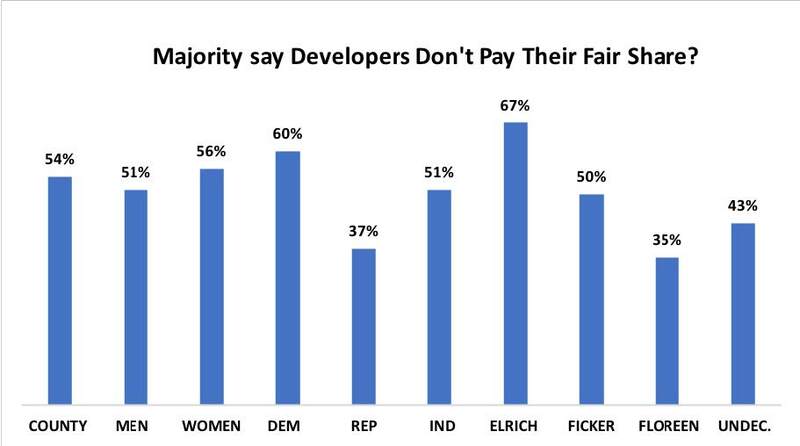 Reliance on developer money was a greater issue. Voters found gender a largely unpersuasive reason to vote for Floreen. In response to learning that she was the only female candidate, 22% were more likely to support her, 16% were less likely to support her, and 62% didn’t care. In other words, Floreen didn’t win or lose due to her gender. More tellingly, Elrich had higher rates of support among women (58%) than among men (52%). In contrast, Floreen had more support among men (17%) than among women (12%). There is often a gender gap in favor of Democratic candidates, but Floreen was unable to close it as the sole female candidate. In a guest blog post, Seth Grimes argued that Nancy Floreen split the Republican rather than the Democratic vote. The poll suggests that she didn’t really split either party’s vote. According to the survey, Floreen did far better among independents (26%) than either Democrats (12%) or Republicans (7%). Both Elrich and Ficker had support of roughly three-quarters of their party’s voters. In heavily Democratic Montgomery, that worked to Elrich’s great advantage. Perhaps highlighting her history as a Democrat and photos with Hillary Clinton limited Floreen’s ability to make inroads into Republicans. It has always been hard to get the public interested in the role of money in political campaigns. Elrich’s participation in public financing made 39% of voters more likely to support him but 29% less likely and didn’t matter to 32%. It’s a net positive but not a huge one. The public, however, is much more interested in who donates to a candidate. 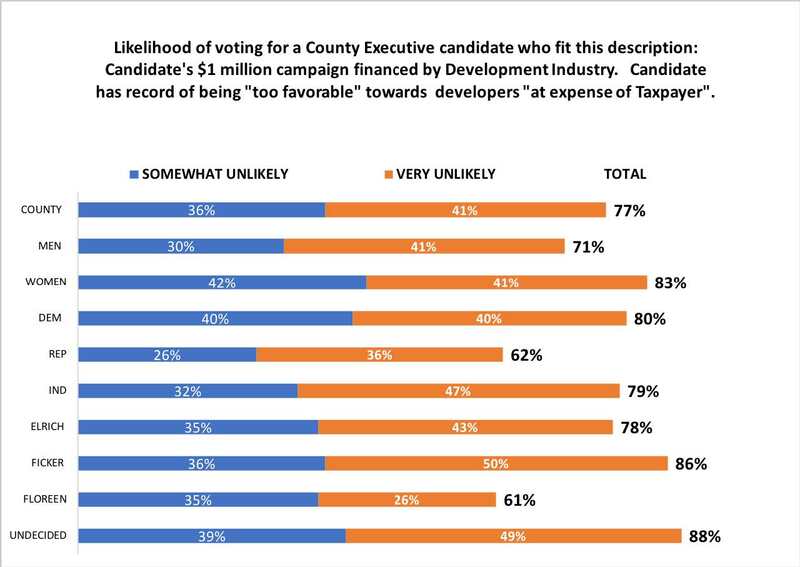 Telling voters that Elrich “will take no contributions from the real-estate development industry” made 64% more likely to vote for him and just 17% less likely. In contrast, telling voters that Floreen “will raise over 1 million dollars for their campaign with over 90% coming from the real-estate development industry” made 76% of voters less likely to support her and only 7% more likely. No wonder Elrich’s campaign worked hard to promote that story in the media. As the following graph shows, the impact of linking her contributions to messages that Floreen has been too favorable to developers at the expense of taxpayers had an extremely negative impact on support for Floreen, especially among undecided voters. Note that the messages were tested after initially gauging support for the candidates, so as not to taint these results. Nancy Floreen has long been one of the most adept members of the county council. She has unquestionably been one of its leaders. For example, she led the fight to revamp the zoning code. This is a major accomplishment. On the good news front, gender just didn’t matter much in the election. It was a slight positive, if anything, for Floreen and voters appeared more focused on other concerns. This should encourage more women to run in the future. After all, we want candidates to be judged on the merits. In this political cycle, Floreen’s past advocacy for developers wasn’t advantageous. Her arguments that we need to give them freer rein and not make them pay more in order to have stronger economic growth didn’t gain traction. By running on them, she helped turn County Executive-Elect Marc Elrich’s decisive 64% victory in a mandate for his side of the argument. Regardless of what you think of her issue positions, Councilmember Nancy Floreen has been exactly the type of smart and hardworking official we need in public office. I’ve always appreciated her willingness to be direct and defend her positions. Running and serving in public office is not easy. She has done it more than ably for four terms on the Montgomery County Council and one term as Mayor of Garrett Park. I wish her well. MoCo Waits: How Many Ballots Remain? Here is an unofficial report on how many ballots remain as of 10am this morning. There are 3,621 provisional ballots. 2,456 were were Democratic ballots. So far, 1,872 have been accepted by staff with 424 more accepted in part (i.e. for some offices), and 210 rejected. There are about 2,245 potential votes for county executive here. Voters requested 10,900 absentee ballots. 6,300 have already been tabulated and counted. That leaves 4,600 potentially left to count depending upon how many are returned. So far, there are 1,400 left with ballots that arrive this week also counted if there were postmarked by 5pm on June 26th. How Will This Impact the Race for County Executive? Based on the current number of absentee ballots, Blair would fall short of catching up to Elrich by fewer than 100 votes if he keeps gaining votes at the same rate. Of course, we do not know if late absentee voters followed the same pattern as early absentee votes. The big question is the provisional ballots. Will Blair also gain votes there? Or will they follow the pattern from election day or even maybe favor Elrich? If they follow the same pattern as the absentee ballots, Blair could eke out a narrow victory but we’ll have to wait and see how it plays out. Heavens to Nancy. We Might Have Competition in a MoCo General Election! You can read some of my thoughts on Nancy Floreen’s mulling over entering the county executive race in an interview with WAMU. In essence, I consider it virtually impossible that Councilmember Floreen plunges into the race if David Blair ends up winning the tightly contested Democratic primary. Floreen’s bid is being talked up by the more or less the same developer folks who back Empower Montgomery and vehemently oppose Elrich. David Blair has a different background from Nancy Floreen. He’s a former business exec, while she has earned her political stripes serving as Mayor of Garrett Park, on the Planning Board, and on the county council. But their issue positions aren’t radically different. Essentially, a bid by Floreen would be a mulligan for the business community if Blair loses. Even more important, Floreen would lack the essential money from the business community required for a serious campaign. Getting on the ballot is tough enough in such a short period and would be hard to do without financial support. Of course, that leaves aside the money needed for a campaign or fighting a lawsuit challenging her eligibility to be on the ballot because she filed to run as an unaffiliated voter while still registered as a Democrat. Some argue that Floreen’s gambit is an effort to try to get a women into power after the county executive and council primary results resulted in the nomination of one woman. At the end of the day, I tend to regard that as nice verbiage that will disappear if David Blair wins the nomination. Besides, Nancy Floreen has a lot more to offer beyond “girl power” as a candidate. Earlier today, Del. Kirill Reznik made the case that the Democratic candidates are all good, reasonable people. Boiled down, it articulated the wisdom of the old, typing practice phrase “Now is the time for all good men to come to the aid of their party.” It’s time for Democrats to rally around the winner. Except it’s hard for me to get that exercised about the idea of Nancy Floreen running as an independent. If an independent like Bernie Sanders can take lots of Democratic Party money for his Senate bids and even run for the Democratic presidential nomination, why can’t a Democrat like Nancy Floreen run as an independent? The Republican label is now so toxic that it’s virtually unthinkable of a Republican winning an election in Montgomery. Having Robin Ficker as your champion doesn’t help. That has forced all contests into the Democratic party, and only a select share of the electorate participates in the Democratic primary. Many voters end up frustrated as it renders the general election meaningless. Parties are valuable because they provide useful cues to voters as a starting point (often an ending point) in evaluating candidates. There are divisions but no truly organized factions within the Democratic Party to structure politics for voters. Moreover, as V.O. Key noted long ago. one-partyism facilitates rapid ideological movement within a party of the sort we’ve seen in Peter Franchot’s evolution from progressive tribune to Hogan buddy. The increasing leftward trend of the Democrats and extreme right-wing nature of the vast majority of today’s Republicans leaves a lot of unoccupied space in the center. Unsurprisingly, some pols may begin to take advantage of it and a lot of voters might well respond. I should make clear that, while I respect Nancy Floreen, that these points are general rather than specific. She’s right that the county could sorely use more competition in the general. At the state level, the Democrats would also benefit as it would help motivate Democratic voters to turn out in the general election. More specifically, I do not share the fears held by some in the business community regarding Marc Elrich as county executive. It’s important to look at specifics beyond ideological type. Elrich is far from someone who simply mouths progressive slogans and will mindlessly attempt to implement them. If you listen to him speak in detail about issues, it’s clear that he’s highly knowledgeable and has many concrete, practical ideas that are far from whackadoodle to address problems that all Democrats claim they want to address. Elrich will also have to deal with a county council with a range of views. Assuming he wins the Democratic primary, I think he deserves his shot and will have my vote. I can say the same regarding David Blair. Though I end up with the same vote as Kirill Reznik here, I applaud people looking beyond party (at least when the candidates merit it). Small-d democratic competition is healthy. Let’s embrace it. P.S. Having assumed life would be dull after the primary, I’m stepping away from the keyboard for a few weeks. I trust Adam Pagnucco will continue to make healthy mischief in my absence. Yesterday, Adam Pagnucco explained that David Blair needs to win the outstanding ballots by 6.2% in order to pass Marc Elrich in the final vote tally. The absentee ballots counted yesterday suggest that this is entirely possible. Yesterday, 3793 absentee ballots were counted. Among those voters, 3292 participated in the Democratic primary. Fewer voters tend to cast votes as one goes down the ballot, a phenomenon known as roll-off. In the Democratic primary for county executive, 3140 cast valid votes. Blair lead Elrich by 7.1% among the absentees counted, which allowed him to pick up a net 223 votes and close the gap with Elrich to 269 votes. Substantial numbers of absentee and provisional ballots have yet to be counted. Why the difference between election day and absentee voters? It could be a number of factors. One reason might be if Blair had a better absentee voter program than Elrich. Once an absentee ballot is requested, it’s vital for campaigns to contact a voter in order to try to obtain their vote. Another explanation might be that voters who made decisions prior to election day tended to vote differently than those who cast ballots on the day itself. Even when the count is finalized, I could well imagine the losing campaign requesting a recount. In this county executive race, I’ve been looking for someone who can shake things up a bit. This doesn’t mean that I think Montgomery County is a bad place to live or that Ike Leggett has done a bad job. On the contrary, County Executive Leggett saw us through a deep recession and protected key county services by making tough choices. I grew up and love living here. But Montgomery County is not on a sustainable path. We need to do more to encourage employment and economic growth. The current model of county government cannot continue as it relies on ever greater expenditures that we still have trouble meeting even now that the recession is behind us. As a result, I’ve been looking for a candidate for county executive who recognizes our many manifest strengths but is unafraid to try new solutions. I’d like our new county executive, whatever their political perspective, not to feel trapped by how we’ve handled matters in the past. We have a number of excellent candidates this year. As we head down the home stretch of what has been an unusually hard fought and negative campaign by Montgomery County standards, tempers are beginning to fray. I hope we can all take a deep breath and recognize that just about all of the candidates have the skills required to serve ably as county executive. Rose Krasnow is a triple threat in terms of experience working on Wall Street, having lead a major city government in Rockville, and holding a senior position at the Planning Board. If you speak with her, it rapidly becomes clear that she is extremely fluent – more than most sitting politicians – in the complex issues of the budget and planning. At the same time, her campaign’s emphasis on experience has left me wondering how she’d be innovative beyond favoring growth. I have long made clear that George Leventhal is temperamentally unsuited to be county executive. Nonetheless, I’d regard it as a sign from above that this blog should continue for another four to eight years if he won, as he and Robin Ficker provide more than enough copy. George is already wearing Superman outfits. Can we get him into cheetah shorts? Seriously though, his support from a group that wants massive new development on River Road, despite no plan for transit there, and for rezoning single-family neighborhoods for apartment buildings gives me the heebie-jeebies. Bill Frick knows how politics works from his experience in the House of Delegates. Yet he is outside county government and has a real zest for restructuring it, as his leadership in taking on entrenched interests supporting our county’s liquor monopoly demonstrates. Like Rose, he’d like to get the county’s growth engine moving again. Unfortunately, his campaign just doesn’t seem to have taken off. In my view, Roger Berliner has the strongest “insider” case to make. He has a number of nice accomplishments under his belt, including good work on the environment. Compared to many, he has a far more intuitive understanding of the perspective of ordinary residents on issues such as PEPCO service and the impact of federal tax changes on county residents. He has been making the case that he knows how to innovate (think evolution, not revolution) and has had good success at building coalitions on the Council. Roger has struggled because it’s an anti-establishment year and David Blair has taken much of the oxygen his campaign needs. That leaves Marc Elrich and David Blair, who are seen as the leading two candidates despite the absence of any public polling data. Despite having served on the Council for three terms, Marc Elrich is unquestionably still an outsider who is not part of the Rockville consensus. He has never been elected council chair. While some might see this as a sign he doesn’t play well with others, it is more of a badge of honor in a year when voters are highly critical of the Council. Marc makes many happy but others quite nervous because of his strong progressive viewpoint. But he simply is not Montgomery County’s version of Hugo Chavez. More importantly, he is not some ideologue who is all hat and no cattle. This is a candidate who has thoughtful, practical, concrete ideas on how to make meaningful change that benefits all county residents. His plan for countywide BRT remains the best, biggest idea proposed to combat transportation problems that cause development-limiting and soul-killing traffic in a long time. In Marc’s case, his professed desire to help “all residents” is not simply a code for only the poorest, though his passion for politics stems from working to help people who are struggling. Marc gets that the middle class face increasing burdens. Unlike some progressives, he also understands fully that the county cannot flourish without its share of successful businesses and upper class residents, so demonizing them is not the solution. Marc hasn’t held executive positions previously but has clear ideas about how he would restructure county government from day one. One concern has been that he has a progressive candidate would cause skittish business to shy away. Except that I think business would quickly see that, while we’d have some real change, the People’s Republic is not upon us. David Blair has burst on to the political scene thanks to the political ads that he has been able to self-fund and two editorials endorsing his candidacy from the Washington Post. I’ve met David but since he hasn’t previously had a high local profile or been active in politics, he is less of a known quantity to me. As with Marc Elrich, I would ignore stereotypes that suggest David Blair is the boogeyman is disguise. His having been a Republican many years ago should not be disqualifying. Yes, he is a businessman running for office but he is not Trump II. Though it’s a low bar, I see no sign that he shares any of Trump’s repulsive bigoted narcissistic tendencies. People who know Blair think he is a terrific guy and would be a great county executive. At the same time, I have some concern with plutocratic politics. I admire successful businessmen but don’t know that his success always translates into political acumen and am uneasy with the idea that the ability to spend a lot of money on a political campaign is a qualification for public office. But not all wealthy businessmen are the same. Jim Shea, a trailing gubernatorial candidate, has been deeply involved in the Baltimore community for years, and has lots of thoughtful ideas for Maryland. David Blair brings some real assets to the table. He would have instant credibility with the business community. Unquestionably, he has executive skills. Unlike many executives, he seemingly has the ability to hear people and listen to them, as well as give marching orders. If elected, he’ll need to develop them further in order to work with a Council that doesn’t work for him. I think he’ll have the ability to run with good ideas even if they didn’t pop out of his own head. We are committed to ensuring the best and brightest lead our departments and are fortunate that many of these leaders are already in place. We will evaluate each position and our approach will be comprehensive, transparent and inclusive. Voters can view this as a sensible process for ensuring orderly turnover and acknowledging that many good people are already in place who would know how to carry out needed reforms. Alternatively, others will see this as someone who isn’t quite ready to hit the ground running and is still learning about county government departments. The other concern from my perspective is the need for more business versus residential development. Though there is a lot of residential development slated to go ahead, developers want more density and development for the same reason that government employees want higher salaries. Except residential development is different from other kinds of business because it brings new residents who demand a welter of more expensive services. In particular, few residents are net contributors to the county budget while they have kids in school, as education takes up half of the county budget. Our infrastructure is already strained. We need more business beyond residential development to bring in the revenue to pay for it. As a businessman, I think David Blair grasps that idea well and has emphasized business in his campaign. But his major outside funding and backers comes from the development industry. Like many candidates, I’m grateful that the primary will be over tomorrow night. Not to flail a dead horse, but remember that we have a lot of good people running for office and respect the choices of our fellow citizens. Let’s also comfort and thank those who run but don’t win. Running for office isn’t easy and Montgomery is fortunate to have so many willing to put themselves out there. Lobbyists Sushant Sidh and David Carroll, Jr. have filed a complaint against Marc Elrich and Roger Berliner’s campaigns for county executive. Sidh and Carroll are principals at Capitol Strategies, an Annapolis lobbying firm that represented Catalyst Rx while David Blair was still CEO of the company. I am posting the complaint made by Sidh and Carroll to the State Board of Elections below in full, which has already been discussed on A Miner Detail. Seventh State received a copy of the complaint via email from Sushant Sidh at 4:59pm on Friday afternoon. As Adam has previously mentioned, we both receive requests to publicize dirt on campaigns. Seventh State did not publicize this claim alleging illegal collusion between Progressive Maryland and the Elrich and Berliner campaigns because I think it has little merit. The complaint uses words like “reasonable to assume” and “there is reason to suspect” but provides no hard evidence for gauzy suppositions with the sole source being a reference to an article in A Miner Detail. The follow-up email on the amended complaint this morning at 10:26am does not contain any further information. This complaint followed on one previously filed by Brian Kildee alleging coordination between David Blair and Empower Montgomery. Blair was one of the founders of Empower Montgomery. (The complaint cites a 7S post that points out that Blair’s name was removed from the website listing of the founders.) While Kildee has donated to Bill Frick, also a candidate for county executive, he has not been linked to either the campaigns of Marc Elrich or Roger Berliner. Seventh State did not publish this complaint either, which has also now been posted below. Kildee’s complaint contains a number of attachments that I haven’t posted here. This complaint is more interesting but does not, in my view, contain conclusive proof of coordination between Blair and Empower Montgomery. I do not know if Sidh and Carroll’s complaint was meant as retaliatory but the timing will only serve to feed such speculation. Efforts to reach Sidh and Carroll for comment immediately before publication of this piece were unsuccessful. The Washington Post sure has done a number on Marc Elrich. In a second editorial endorsing David Blair for county executive, the Post quoted Elrich stating “I prefer to put jobs in Frederick” as proof that he “wants to focus employment elsewhere” – seemingly a damning charge against a candidate for Montgomery County executive. Broadly, Elrich isn’t convinced Montgomery County needs to add many new homes or residents, or jobs. Many people with jobs in Bethesda or DC are now living in Frederick County and other outlying areas and driving through Montgomery to get to work. We asked Elrich what he’d do for these folks, and his answer was, “I prefer to put jobs in Frederick.” He’d encourage the growth of both households and jobs to happen there, and in Prince George’s County, and elsewhere. I listened to the GGW interview with Elrich and the quote is taken out of context and utterly distorts the record. Marc makes clear that he wants economic growth, indeed that it is vital to the county’s future because our current budget trajectory is not sustainable into the future. If there is no money, he realizes that there will be no way to pay for efforts to do more to help people in poverty and others try to get a leg up. So what did Marc Elrich mean when he said “I prefer to put jobs in Frederick”? It was part of a much larger discussion of housing policy but the broader point was that it would be good to have jobs in many locales, including Frederick City, so the people up there don’t have to commute so far, which would also help alleviate traffic in Montgomery – an enormous concern – and help the environment. He’d like to see more people have shorter commutes and more jobs near them around the region. That includes Montgomery, where many people suffer in traffic on the American Legion Bridge every day and probably would just assume not live their life stressing about whether traffic on the bridge is going to prevent them from picking the kids up. Moreover, the discussion was taking place in the context of the regional Council of Governments’ goal for housing and jobs around the region, which unsurprisingly includes plans for more of both in Frederick. More broadly, Elrich doesn’t see economic activity as a zero-sum game where Frederick’s gain is necessarily Montgomery’s loss. Ironically, the Post has repeatedly lamented that DC, Maryland and Virginia didn’t come together on a bid for Amazon, an idea in the same vein, so I would have thought they’d appreciate this bow toward regional cooperation. The late Kevin Kamenetz didn’t bid for Amazon because he thought it belonged in Baltimore City and that Baltimore County would nevertheless benefit. Both the Post and GGW have distorted the record. They clearly think Elrich is wrong for Montgomery County. But they shouldn’t twist his words out of all recognition to make their argument. It just undermines their case. Voters would find many of the ideas that GGW pushes hard in their interview far more shocking than Marc’s points. GGW’s version of “smart growth” doesn’t focus primarily on areas close to transit hubs and stations but promotes much higher density at almost any location with a bus line or they deem bikeable. The heavily trafficked River Road Corridor is a prime example of where they’d like to see far more housing units built. They’d like to have seen far more density at Westbard, and to extend the Purple Line down the Capital Crescent Trail there. Previously, they’ve attacked the Kentlands as insufficiently dense, so their vision of “smart growth” is quite different from what many argue is good suburban development. They also want Elrich to support allowing people to sell single-family homes to be torn down for high density buildings. Elrich sensibly pointed out that people who buy homes want some security in the neighborhood and that people who don’t want to move just end up next to a tall building with super high property taxes that they can’t pay. My guess is that GGW’s platform would not exactly get people to flock to their endorsed candidate, George Leventhal. Most bizarrely, while smart growth advocates heavily pushed for more density around Metro and the Purple Line because there is no more room to build, GGW turns that on its head in its post inveighing against Elrich, claiming that he would open up far too little of the county to development. In my view, that’s not smart growth. It’s just development writ large. Elrich’s promotion of a bus-rapid transit system for the county is probably the most pro-growth and pro-smart growth initiative launched in recent years, which makes GGW’s opposition all the stranger. My hope is that it would help start to break the Gordian knot of conflict between civic associations and developers by providing a real transit system for Montgomery that addresses transportation issues even as we grow. GGW touts Leventhal as a proponent of “real” BRT because he wants it wholly in separate lanes, which would require more property takings, make it much more expensive, and therefore unlikely to happen. Marc argues sensibly for reversible BRT lanes, as there is no need for a separate lane going against rush hour traffic. That’s spending smart, something our government badly needs. Just four years ago, I watched George Leventhal taking a passive aggressive negative approach towards Elrich’s BRT proposal without outright opposing it during a debate. He also lambasted now Council President Hans Riemer for the seemingly mild proposal to spend more on and improve Ride-On Bus service, an idea that David Blair now wants to put on steroids. I understand GGW applauds George for his staunch Purple Line support. But as on the minimum wage, he has been highly changeable on taking their transit vision into the future. We have a lot of excellent candidates for county executive beyond David Blair and Marc Elrich, including former Rockville Mayor Rose Krasnow, Councilmember Roger Berliner and Del. Bill Frick. There are excellent cases for all of them and plenty of room to critique Elrich’s housing and other policies. I haven’t voted yet and am still looking closely at them. Let the debate continue but based on their actual records and positions. The Washington Post took Councilmember Roger Berliner (D-1), a candidate for county executive, to the proverbial woodshed for having the temerity to compare David Blair, their preferred candidate to Donald Trump. That ship had already sailed when George Leventhal made the same comparison to another businessman candidate, David Trone, so it’s not exactly unexpected. Where the comparison breaks down is that David Blair is by all accounts not a narcissistic, racist, sexist, congenitally lying bigot who enjoys publicly abusing people and acting inappropriately on the campaign trail in ways that demean himself and the office. Unlike Trump, Blair strikes me as very confident rather than supremely insecure and in need of constant reassurance. He also possesses the ability to listen and to take in new information. The comparison nevertheless has some validity. Running a county government is vastly different from running a corporation, as many business executives who have entered public office have quickly discovered. While Blair thinks he can quickly build relationships with the new Council, it’s just not going to be that simple. They wouldn’t be his employees and may have completely different, even opposed goals. Victory with less than 40 percent in a Democratic primary is hardly likely to inspire deference. Voters also have some reason not to trust the Washington Post’s judgement in this matter – not so much because of their centrist ideology but their track record. The apt comparison is not to Donald Trump but to the last time the Post wrote multiple editorials endorsing a local business outsider: Sharon Pratt Dixon. The Post argued rightly that that the city needed someone who was more than just not Marion Barry but a proponent of major reform. They argued passionately, but it turned out wrongly, that Dixon was that person. Dixon was a wonderful speaker who articulated a great vision but showed no ability to carry it out after winning the Democratic primary with 34% of the vote. Her failure led to her coming in third in the 1994 primary with just 13%. The winner was Marion Barry, a born pol, with 47%, leaving the District back where it started. It took Anthony Williams, who had experience as the city’s CFO, to lead the city a positive new direction and make changes that still matter a lot today. So the Post may be right about Blair. If you like him and his ideas, that’s great. But don’t let the Post’s strong conviction in their choice sway you too much. The Post focuses very strongly on the District these days in their local coverage. Your knowledge of the local scene may well be better and your intuition about what Montgomery needs just as valid.